A German-Egyptian excavation mission in the Nile Delta town of Tel-Basta unearthed today a life-size statue of the 19th Dynasty King Ramses II carved in red granite. The statue, at 195cm high and 160cm wide, was found accidently during a routine excavation carried out by the joint mission. It was discovered in the so-called Great Temple area's eastern side, inside the temple of cat goddess Bastet in Sharqiya's Tel-Basta. 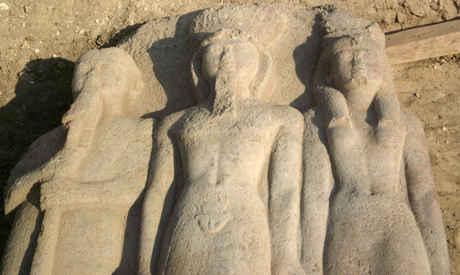 Antiquities Minister Mohamed Ibrahim explained that the newly-discovered statue depicts King Ramses II standing between the goddess Hathor and the god Petah. On its back, Ibrahim continued, a hieroglyphic text and the cartouche of the king are engraved. Mohamed Abdel-Maqsoud, head of the Ministry of State for Antiquities' (MSA) Ancient Egyptian department, added that the mission uncovered another statue carved in sand stone which depicts a yet-unidentified New Kingdom top official. A hieroglyphic text offering the statue to the goddesses bastet and sekhmet and the god horakhti is engraved on its back. This statue is 35cm in height and 25cm in width, according to Abdel-Maqsoud. "This is a very important discovery that sheds light on the history of Tel-Basta in general and on this area in particular," Abdel-Maqsoud told Ahram Online. He added that the discovery, in addition to previous finds in the area, suggests that Tel-Basta was once home to a New Kingdom temple dedicated to King Ramses II, which might be uncovered in the future. You say Petah, I say Butah. Since he is depicted at Hall of Sokar (Show Car) while standing with Amun, I say ShakaMuni Buddha. You say Peter. Interesting.